Palestinian Prisoners’ Day, marked since 1974, is an international day of action, solidarity and support for over 7,000 Palestinian political prisoners in Israeli jails. Events and actions will take place in cities and on campuses around the world, in solidarity with the struggle of Palestinian prisoners. 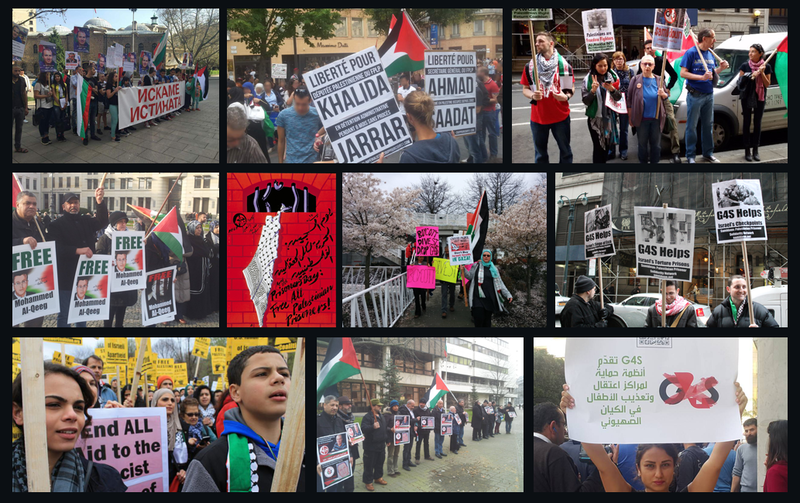 Samidoun Palestinian Prisoner Solidarity Network is providing the following materials to help support events for Palestinian Prisoners’ Day and beyond. Please feel free to download, print, and re-circulate these materials! Social Media campaign for Palestinian Prisoners: Change your profile picture for Palestinian Prisoners Day! 1.) Print sign at A4/8.5 x 11 and place face down on a copier that prints A3/11×17. 2.) Using A3/11″ x 17″ paper, enlarge the layout to 200% of the original. 4.) Copy the bottom half of the sign on 11″ x 17″ paper to 200% of the original. 5.) You now have two 11″ x 17″ ledger-sized sheets of paper which when glued, taped or stapled, one above the other, will make a 17″ x 22″ sized sign.